This listing has all known signal boxes on Network Rail (and its predecessors) that had signal prefix codes. Signal boxes without codes are in the main excluded; only those of interest to the editor are included. The photograph below shows a prefix code "in action" at Minster. The initial letters define the signal box controlling the area, then the next digits are the individual signal number. In this example the final four digits denote the telephone number a driver should use to contact the signaller. As technology changes or lines are opened, closed or rationalised, so signal boxes open and close. This listing attempts to show these changes in line control. The phrase "control passed to…" refers either to a modern signalling installation, or to just one traditional absolute block signal box. Thus, where signal boxes A, B and C once existed and B has closed, this page does not refer to both A and C, but just one. Where a box closes and leaves very long block sections between remaining adjacent boxes, a subjective assessment has been made of the closest box as "controlling" the line. This is not a perfect system by any means, but it helps to keep the tables small. In cases where the direct "descendant" is not known, a later "descendant" is substituted. Only the first change of control is shown. For example, Stone Crossing is shown as controlled by Dartford (D). Reference to Dartford shows that this has passed control to Ashford North Kent Signalling Centre (NK). Only the first link is shown under Stone Crossing. The symbol - (hyphen) in the code column indicates that it is known that no code was ever carried. A blank means that no code is known: there may or may not have been one allocated. Please remember that these pages concentrate on signal box prefix codes; therefore data presented primarily concerns these signal boxes only. Please also note that mileages quoted are for the signal boxes themselves, not necessarily for any nearby junction. 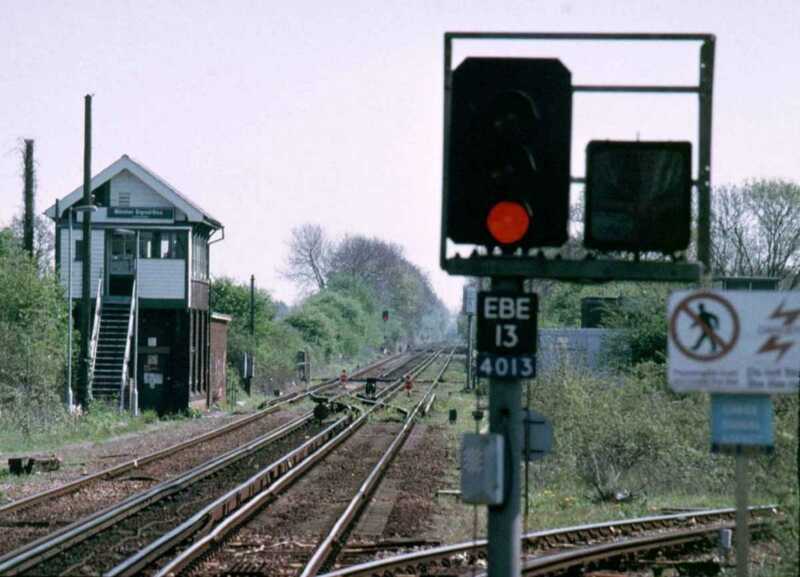 Further information about signalling may be found at the Signal Box web site, and Andrew Overton's British Power Signalling Register gives a huge amount of information about the different power signalling equipment used. The Signalling Record Society may also be of interest. In addition, the definition of various signalling-related signs can be found on the "Railway Signs" pages. To see how all this fits into one comprehensive network, the Sectional Appendix will be of interest (buy from Willsons or view historical scans at Limit of Shunt). If you have a railway telecommunications background, the Communications Museum Trust would like to hear from you. This fascinating museum aims to fill a gap in railway technology history.